Weather from the Bridge: 28.9o C (dry bulb), Wind 6 knots @ 250o, overcast, 2-3′ SE swell. 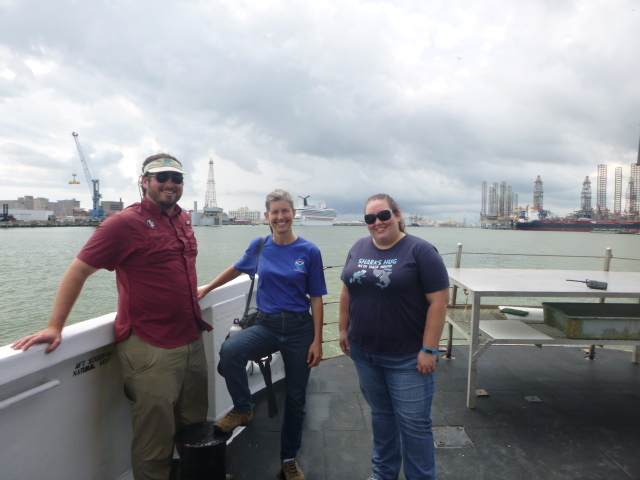 The muggy afternoon air did not dampen my excitement as we left Galveston, Texas, aboard the National Oceanic and Atmospheric Administration (NOAA) Ship Oregon II. 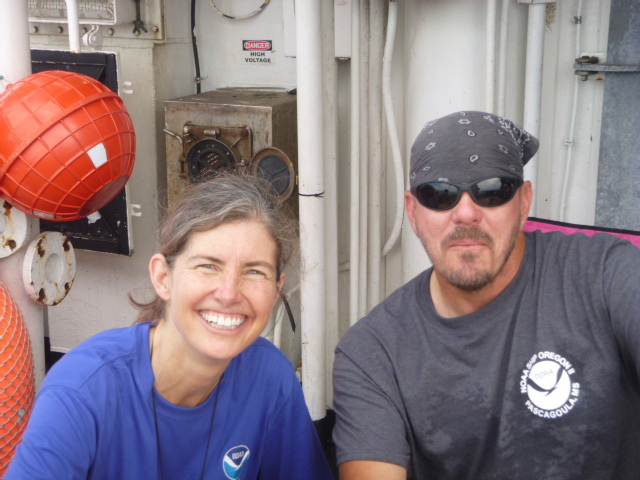 I am a NOAA Teacher at Sea, participating in a longline survey in the Gulf of Mexico, surveying sharks and bony fish. When I tell people about the Teacher at Sea program, they assume I teach high school or college, not second grade in rural Tillamook, Oregon. Yet spend a few moments with any seven or eight year old and you will find they demonstrate significant potential as scientists through their questions, observations, and predictions. Listen to them in action, documented by Oregon Public Broadcasting, at their annual Day at the Bay field trip. Just as with language acquisition, exposing the young mind to the process of scientific inquiry ensures we will have a greater pool of scientists to manage our natural resources as we age. By inviting elementary teachers to participate in the Teacher at Sea program, NOAA makes it clear that the earlier we get kids out in the field, the better. Each year, my students develop a science or engineering project based upon their interests. 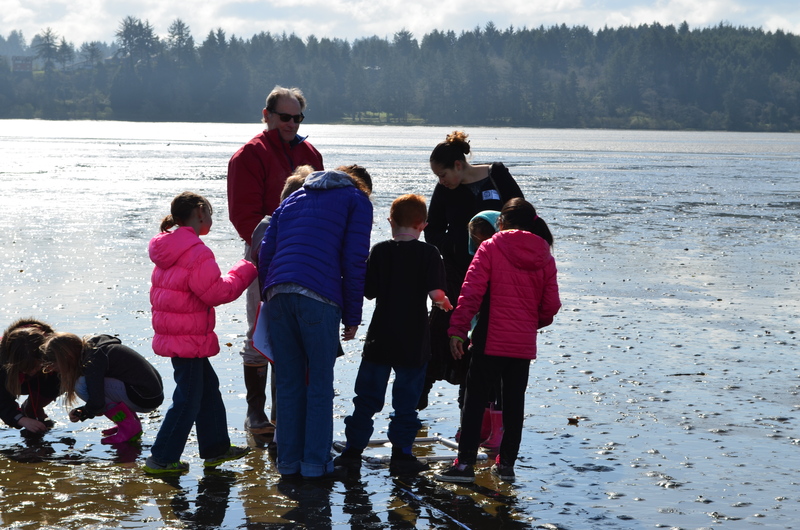 Here, South Prairie Elementary students survey invertebrates along a line transect as part of a watershed program with partners at Sam Case Elementary School in Newport, Oregon. The NOAA Teacher at Sea program will connect my students with scientists Dr. Trey Driggers, Paul Felts, Dr. Eric Hoffmayer, Adam Pollock, Kevin Rademacher, and Chrissy Stepongzi, as they catch sharks, snapper, and other fish that inhabit the Gulf of Mexico. The data they collect is part of the Red Snapper/Shark Bottom Longline Survey that began in 1995. The survey, broken into four legs or parts each year, provides life cycle and population information about many marine species over a greater geographic distance and longer period of time than any other study of its kind. Leg IV is the last leg of the survey. After a long season of data collection, scientists, sailors, and fishermen will be able to return to their families. My twelve hour shift begins tomorrow, September 17, at noon, and will continue each day from noon until midnight until the most eastern station near Panama City, Florida, is surveyed. Imagine working 12 hour shifts, daily, for two weeks straight! The crew is working through the day and night, sleeping when they can, so shutting the heavy metal doors gently and refraining from talking in the passageways is essential. I got lucky on the day shift: my hours are closer to those of a teacher and the transition back to the classroom will be smoother than if I were on the night shift. Approximately 200 stations, or geographic points, are surveyed in four legs. Assume we divide the stations equally among the legs, and the first three legs met their goal. Leg IV is twelve days in duration. How many stations do we need to survey each day (on average) to complete the data collection process? This math problem might be a bit challenging for my second graders, but it is on my mind. I wonder what kind of sharks we will catch. Looking back at the results of the 2015 cruise report, I learned that there was one big winner. More than half of the sharks caught were Atlantic sharpnose (Rhizoprionodon terraenovae) sharks. Other significant populations of sharks were the blacktip (Carcharhinus limbatus) shark, the sandbar (Carcharhinus plumbeus) shark, and the blacknose (Carcharhinus acronotus) shark. My fellow Teacher at Sea, Barney Peterson, participated in Leg II of the 2016 survey, and by reading her blog I learned that the shark they caught the most was the sandbar shark. 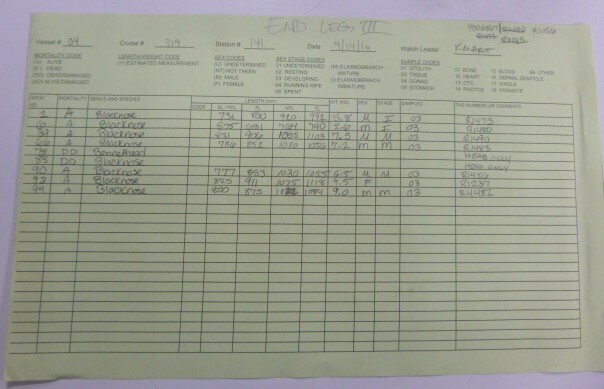 In this sample data sheet from the end of Leg III, all but one of the sharks caught were the blacknose sharks. Notice the condition of two of the fish caught: “heads only.” Imagine what happened to them! My first memory of a shark was when my brother, an avid lifetime fisherman, took several buses across the San Francisco Bay area to go fishing. That afternoon, he came home on the bus with a huge shark he’d caught. I was mesmerized. We were poor at the time and food was hard to come by, but mom or dad insisted sharks were not edible, and Greg was told to bury the shark in the yard. Our dog, Pumpkin, would not comply, and dug that shark up for days after, the overpowering smell reminding us of our poor choice. I don’t have many regrets, but looking back on that day, I wish we had done something differently with the shark. Since then, I’ve learned that shark is a popular source of protein in the diets of people around the world, and is growing in popularity in the United States. In our survey area, Fisheries Biologist Eric Hoffmayer tells me that blacktip and sandbar sharks are the two most commercially important species. Our survey is a multispecies survey, with benefits beyond these two species and far beyond our imagination. As demand increases, so too does the need for careful management to keep fisheries sustainable. I am honored to be part of a crew working to ensure that we understand, value, and respect our one world ocean and the animals that inhabit it. This entry was posted in 2016, Denise Harrington 2016, Denise Harrington Sept 2016, NOAA Teacher at Sea and tagged Galveston, Gulf of Mexico, introduction, longline survey, NOAA Ship Oregon II, Oregon II, shark. Bookmark the permalink. I enjoy reading your blogs and hope your students are learning as much from them as I am. Although you are surely missed in the classroom, it is great that you are back at sea again!